Cap - 11/4" x 1/4", 90 degrees to clip. Barrel - 11/2" x 1/4". 1 line of repeating copy or personalization on cap or barrel included. Add $.50 per pen for second location of repeating copy or personalization (up to 25 characters). Clip - $2.50 each. Set-up charges for new orders only: $18.00 for PhotoFast; $250.00 for Diestruck, standard sizes. Also available in Gel - Add $.55 per pen to any ballpoint. Burgundy, Navy, Forest Green, Black. All with 24K gold plated trim. Black velour sleeve included. (Roller Ball cartridge is packaged separately from pen to ensure longer life.) Click here for optional packaging. 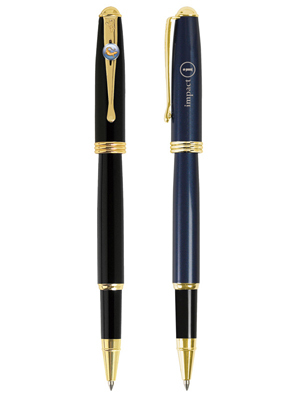 Add $7.91 to your choice of any Worthington pen.